While you and your horse may share an unbreakable bond, unfortunately, you don’t speak the same language. So, in order to properly communicate with your equine friend, you need to use reins. Reins allow you to send a variety of cues to your horse, like for instance when to go, how fast to move and when to stop. With that being said, the reins of a horse are as important as the steering wheel in a car – choose the wrong one, and there’s a high risk of accidents happening. On the other hand, the right horse reins can make sure that the animal clearly understands even the slightest signal, thus allowing you to have complete control over its movements. What’s more, choosing the right reins is important for keeping your horse comfortable. Reins that are too tight and rigid can make the animal agitated. So, if you’re shopping for horse reins, here are some important things to consider. When it comes to horse reins, there are several types to choose from. Which type is most suited for you depends on your riding style. 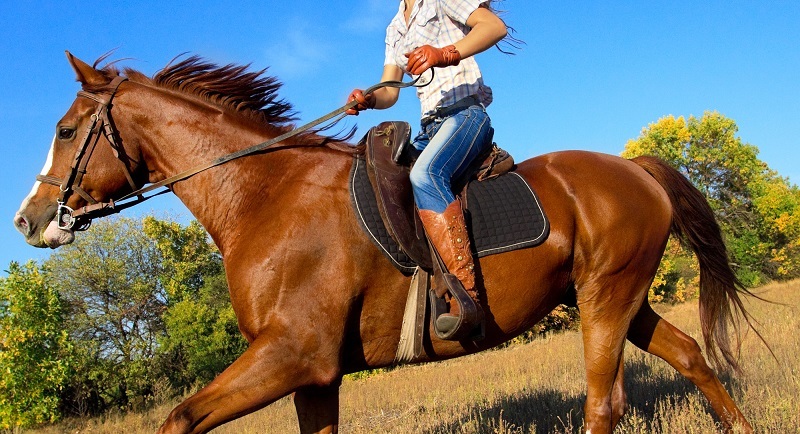 For instance, split reins are great for trail riding because they make it easy to ground-tie your horse by laying the reins down on the ground. These rains can be made long or short and can be used independently or when riding one-handed. You can find them in a variety of widths such as 1/2 inch, 5/8 inch, 3/4 inch and 1 inch. As a result, these rains are very versatile and the most common choice for horse riders. On the other hand, there are roping reins which are mostly used by ropers or people participating in racing. They are also good for children as there’s less risk of dropping them. Usually, these reins are either 1/2 or 5/8 inches in width. Some roping reins also come with buckles that allow you to adjust them in length. And finally, there are mecate reins which can only be used with a bosal and hangar to create the special hackamore bridle. The type of material the reins are made of can determine how well your horse understands your cues. When the reins are of high-quality leather or marine-grade rope, they are heavier and with these, the horse will be more responsive even to subtle signals. On the other hand, if you use reins made of cheap, lightweight leather or nylon webbing, there isn’t much weight which means that you’ll have a hard time sending instructions. What’s more, with lighter reins, you’ll find yourself pulling on them more than you should and therefore applying more pressure to your horse’s mouth which can feel painful. To the end of certain reins, you can also attach a romal which is a type of long quirt. The romal is used only on well-trained and obedient horses because it requires only a slight movement of the hand for direction. When attaching your reins to the bit, it’s recommended that you use a special connection. Although a metal connection might be convenient, it can annoy the horse when it rubs against the bit. On the other hand, a rope or leather connection will be unnoticeable for the horse. This type of connection also gives you better feedback when your horse moves or makes a change.